The 'Girdle' of a diamond describes the outer edge and division between the Crown and Pavilion of a polished diamond. The diameter of a diamond can be found by measuring opposite sides of a diamond girdle using a Leveridge gauge, or calliper gauge. Under the microscope, the girdle of a diamond can vary in appearance. We have listed some of the different types of diamond girdle below. The girdle thickness of a diamond is assessed for estimating the cut grade and for estimating diamond weight. There are no ideal measurements for girdle thickness due to thickness being relative to the size of the diamond. 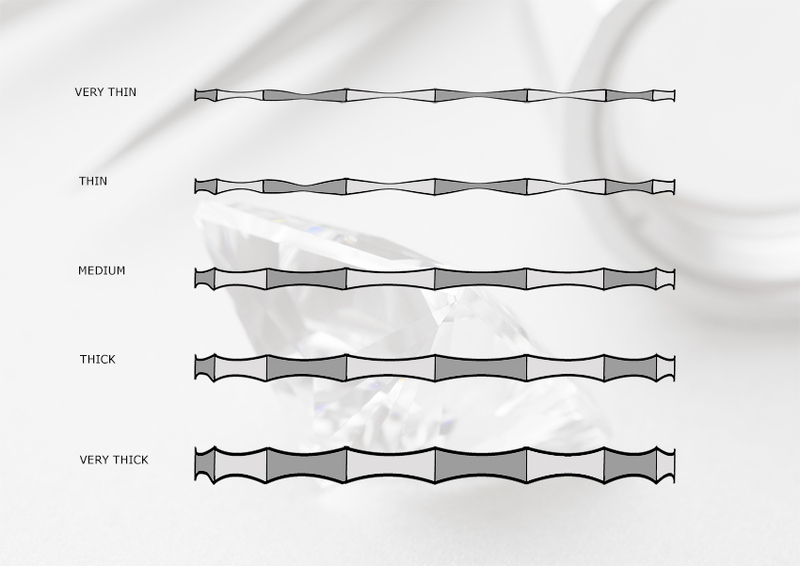 Girdle thickness is compared as a percentage to the diameter of the diamond, but referred to by specific descriptions. (See chart A below). The most significant feature for certified diamond buyers will be the presence of the GIA certificate number and CanadaMark serial number (for traceable diamonds). At Serendipity Diamonds, we specialise in GIA certified diamonds with CanadaMark ethical credentials and full traceability back to the mine of origin. The photograph below was taken to show the CanadaMark number laser inscribed on the girdle of a Princess cut diamond. How thick should a diamond girdle be? A diamond girdle should only be deep enough to protect the diamond during setting. It will also protect the diamond to some extent from chips and nicks resulting from everyday wear. 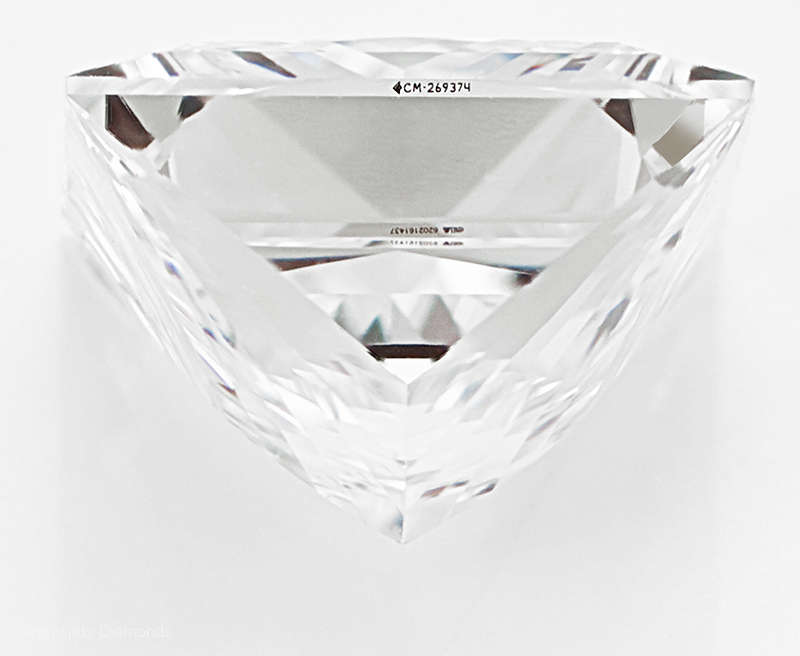 Diamonds with an especially thick girdle often feature in diamonds cut for weight rather than proportions. A thick diamond girdle will rarely diminish brilliance but in extreme cases a thick girdle will allow light to reflect around the inside of the stone. A resulting fish-eyed appearance will detract significant beauty from the diamond. It should be noted that the GIA assessment of girdle thickness is assessed at the narrowest part of the girdle. Under the CIBJO system, by contrast, girdle thickness is assessed at the wider area of the diamond girdle. Chart A. Girdle thickness descriptions. The girdle of a diamond can be polished, faceted or bruted. Faceted girdles are polished with small flattened facets running around the girdle. Bruted girdles appear uniquely as a waxy, matte surface, sometimes referred to as granular in appearance. The effect of bearding can be visible on some diamonds where the surface has small cleavage cracks appearing as feathers running inwards from the girdle. We have already established that girdle thickness is considered when cut grade is assessed. For a diamond to be deemed excellent cut, a girdle thickness between thin and slightly thick are required.